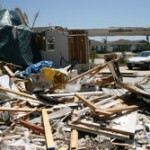 Wind damage (hurricanes, tornadoes, the unannounced storms). Flood Damage (this is usually not structural in nature but can force rebuilds of otherwise good structures. Automobiles crashing into homes and other buildings. A letter stating that things are okay. Plans (reconstruction plans) to be used for cost evaluation and repair permitting. Contact the Engineer Designer if you have damage and need to know how to rebuild it.